Halloween is over (perhaps you dressed as a Spice Girl this year?) and now we shift our focus to the upcoming holidays. Not all of us are lucky enough to live in an apartment community in DuPage County with a 24hr fitness center. For some, the holidays are a time to pack on some unwanted pounds. Whether you’re hosting Thanksgiving or bringing a dish to a gathering with friends and family, here are 3 recipes you can use to make your Thanksgiving a little healthier. Even before the main meal starts, people start Thanksgiving Day loading up on an assortment of yummy dips while watching football. Spinach artichoke dip, chili cheese dip and even buffalo chicken dip are ooey gooey and delicious thanks to sour cream and/or mayonnaise. Instead of a calorie and sodium-heavy dip, consider serving store-bought or homemade hummus. Cut down on calories further by serving the hummus with sliced veggies instead of pita or tortilla chips. Love it or hate it, cranberries are a traditional accompaniment to a turkey dinner. Canned cranberry sauce is not only loaded with extra sugar but preservatives, rendering most of the health benefits of cranberries neutral. Making your own cranberry sauce not only looks impressive but is also so easy. You can throw together this easy recipe together in about 15 minutes. More adventurous cooks can add citrus zest, a little vanilla or even some cayenne pepper to pair the dish to however the turkey is seasoned. It almost seems unpatriotic to strike apple pie from your Thanksgiving menu, but pastry combined with coating the fruit in sugar starts to add up. 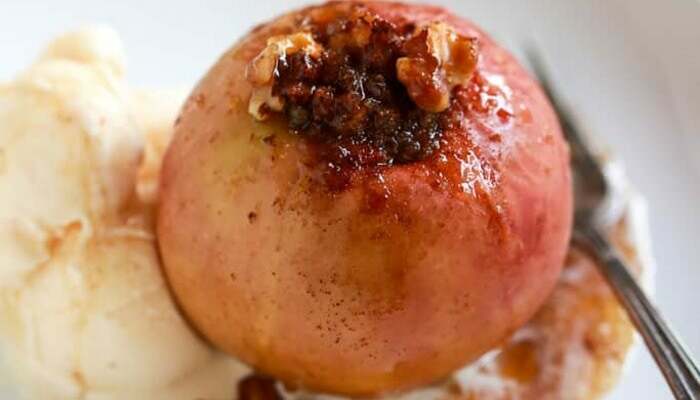 You still get the delicious tastes and smells of apple and cinnamon but cut back on the calories. Walnuts or pecans give this recipe a welcome crunch and added depth of flavor while a scant amount of butter and brown sugar still make this healthy dish feel like a generously portioned holiday dessert. Click here for the recipe.